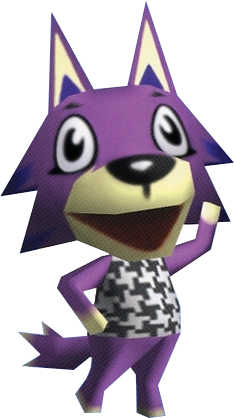 Tarou is a jock, wolf villager from the Animal Crossing series, only appearing in the Japanese exclusive Doubutsu no Mori e+. Tarou is a purple wolf with a tan muzzle and tan paws. He initially wears a Black Tooth Tee. Tarou has a jock personality, having an extreme obsession with fitness, and appearing stereotypically dim-witted. He gets along well with peppy villagers, due to both having unlimited energy, though lazy villagers confuse him, due to opposing lifestyles. Unintentionally, Tarou may also offend a snooty villager by questioning their fitness. Modified on April 14, 2019, at 13:19.